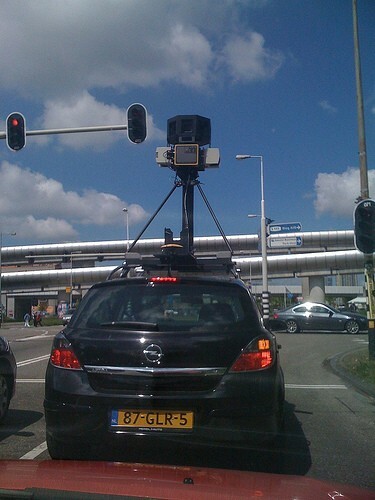 After Germany's Federal Commissioner for Data Protection criticized Google for using Street View cars to scan wireless networks, Google posted a detailed answer that explains how Google collects data about WiFi networks to improve location based services like Google Maps for Mobile. Google says that collecting WiFi network information is not illegal and many other companies collect this data. The signals are initially processed onboard in the car, using software including the standard Kismet open source application. The data is then further processed when transferred to servers within a Google Data Centre, and used to compile the Google location based services database. The equipment within the vehicle operates passively, receiving signals broadcast to it but not actively seeking or initiating a communication with the access point. The information visible to the equipment is that which is publicly broadcast over the radio network, using the 802.11 standard. This includes the 802.11 b/g/n protocols. The equipment is able to receive data from all broadcast frames. This includes, from the header data, SSID and MAC addresses. (...) The equipment also separately records the signal strength and channel of the broadcast at the point at which it was received by our equipment, and is able to establish the protocol used (i.e. 802.11b/g/n). The data which we collect is used to provide location based services within Google products and to users of the Geolocation API. For example, users of Google Maps for Mobile can turn on My Location to identify their approximate location based on cell towers and wifi access points which are visible to their device. (...) Google currently uses 2 pieces of the data collected during the driving operation to build its database and provide location based services - the MAC address of the access point and the GPS co-ordinates of the vehicle at the point at which the access point was visible. This data is stored in aggregate form, and is used to provide the location based service. * This approximate location is geocoded and sent back to the user's device. Now that Motorola decided to replace Google's location services for Android with Skyhook, Google needs to improve the accuracy of the results. Google collects even more data on us than I had imagined. My Android phone is locating me about 2000 km away from my real location due to this "smart" Wi-Fi location feature. Why doesn't it just stick with the cell tower information, I can't imagine. having both cell location AND wifi based location makes the position even more accurate. my android is really precice if i have both functions enabled. so for me it's ok and a great service as long as google doesn't try go get into the wifi and avoids to collect SSID-names (which might be the owners name) and just gathers mac addresses. Let me extend a warm Welcome to you Google Guys in India. Checkout "demo" at GeoRadius Automatic Asset Tracking System. Wow. Google is doing a growing impersonation of George Orwell's characterization of "Big Brother." Pretty soon they will collect every statistic about us, and store it in a huge defective cloud, just like the credit history companies past 30% innacuracy rate. I really do try to use Google as little as possible these days. All of this really is too much. Ridiculous! I really hope that legislature will come up prohibiting collection of this data. This is as close to Big Brother as anyone ever got so far. The fact that so many people use, but so little actually do have understanding of this technology makes it even more questionable, especially without any consent on behalf of the users. YES, let's also legislate blinders so everyone has to walk through the world with a white cane in case they might SEE something. Plucking out all eyeballs would be more reliable I suppose. I believe there is a fundamental Right to Pay Attention, it's not something that is within the purview of any legislative body to abridge. ANYWHERE. If people are spraying their information across the radio spectrum, anyone has a right to passively listen to that.